Laurel is the general name given to numerous evergreen shrubs and small trees of varying flora families. The true laurel is known as the shrub that produces the Bay leaf, which is commonly used in cooking. Early colonists first brought the laurel to the Americas where it has prospered in varying regions. Today, the laurel possesses symbolic qualities that have descended from Greco-Roman mythology. The ancient Greeks depicted the laurel as beholden to the god Apollo, who achieved purification and protection in the laurel groves of Tempe. In the Pythian games, which were similar to the Olympic games, such mythology was extended to the crowning of victors with “the laurel wreaths of Apollo.” Subsequently, the laurel wreath became a symbol of victory in both Greece and Rome. In both cultures, the laurel adorned victorious soldiers, was used as a sign of truce, and was believed to be protection from lightning. Among the Romans, the wreaths guarded the gates of the Caesars. Laurelton Parkway, 136th Avenue, Brookville Boulevard, and 137th Avenue form the boundaries of Laurelton Playground. In April 1880, the Town of Jamaica purchased this property to be used by school district #3. During the Consolidation of 1898, which formed Greater New York, the City acquired the parcel and transferred jurisdiction to the Board of Education. In May 1934, after closing P.S. 38, the Board of Education transferred the property to Parks. 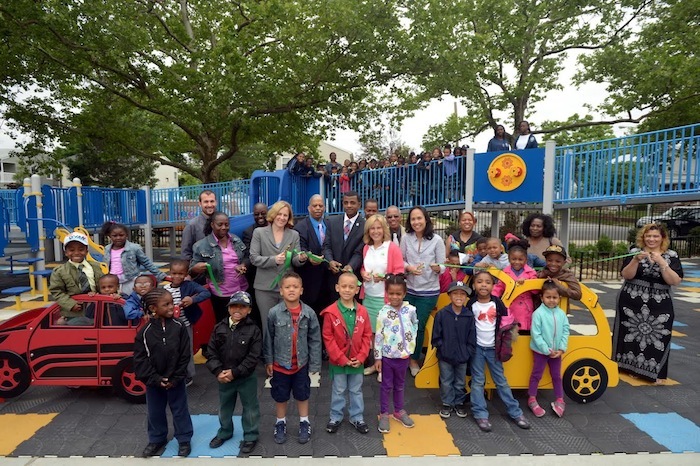 Parks opened Laurelton Playground on August 23, 1935 in service of the local community. Parks acquired two small parcels that were added to this playground during 1936. 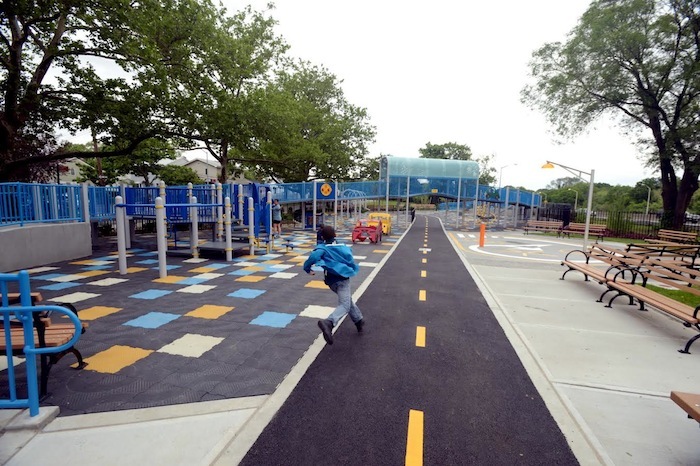 In May 1999, Laurelton Playground received a $610,00 reconstruction sponsored by City Council Member Jaunita E. Watkins. The improvements included the installation of drinking fountains, a flagpole with yardarm, new pavements, a chainlink fence, a steel picket fence, swings, a spray shower, and a pre-cast Doric column. The spray shower is a cast-concrete lion. There is bronze, north-arrow rosette paving the path leading to the spray shower as well as a series of stainless steel Roman numerals. The steel play equipment is adorned with a Roman thematic plaque inscribed with SPQR (the Senate and People of Rome). The park also contains a thematic plaque at the entrance with the mythical founders of Rome, Romulus and Remus, and their mother, a wolf. New plantings include a shademaster thornless honeylocust, crimson pygmy shrubs, China boy and China girl horry, cherry laurel, and compact spreading yew. myrtle and English ivy ground covers were also planted. Three different types of perennial flowers were rooted as well: Frances Williams hosta, snow queen Siberian iris, and maiden grass.